This is the second attempt I have made at the horse's head Bargue plate. I was frustrated with the first try, which had taken a long time, so rushed in to this one without properly sizing it up. In fact, I did everything by eye, taking no measurements whatsoever. The results might *look* okay, but it is actually completely unlike the original plate. Angles are incorrect almost everywhere, and overall it is a very poor reproduction. To make matters worse, I managed to spill a bit of tea on this, which I ended up removing with sandpaper. You can't see it terribly well in this image, because the brightness of the scanner's light has washed it out, but there is a good deal of rough paper where I have erased mistakes too many times. 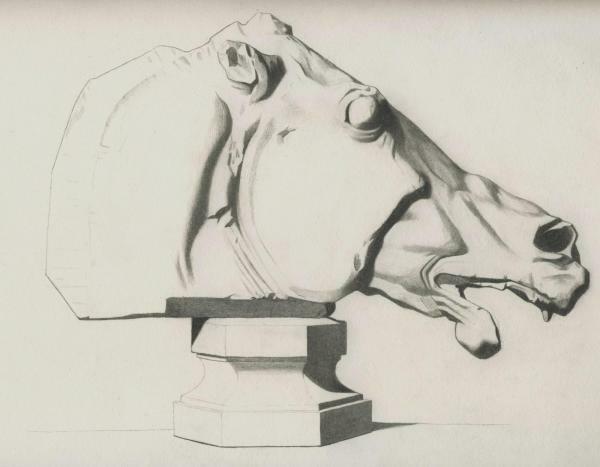 This image, Plate I, 037 - Head of Horse, Parthenon - Attempt 2, by Sam Haskell is licensed under a Creative Commons Attribution-NonCommercial-ShareAlike license.